12 July 2018, at 12:00a.m. In a scientific opinion published yesterday (11 July), EFSA experts investigate the density of the wild boar population in Europe, and assess measures to reducing African swine fever and keep infected wild boar away from uninfected ones. They also identify ways to detect the disease early. 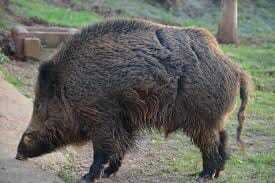 Measures such as intensive hunting and not feeding wild boar should be implemented to reduce the risks of outbreaks. When an epidemic is ongoing, activities that may increase the movement of wild boar should be avoided (for example, intensive drive hunts). Experts could not establish a threshold for wild boar density below which the virus would not take hold – ASF has spread in areas where the presence of wild boar is low. The opinion highlights the importance of a regular dialogue between all involved stakeholders to increase preparedness. Passive surveillance – reporting of dead wild boar – remains the most effective way to detect new ASF cases at an early stage in previously disease-free areas. The opinion stresses the need to harmonise the way in which information on wild boar is collected across the EU to make data more comparable. To fill data these gaps, EFSA is funding a project – ENETWILD – aimed at collecting and harmonising data on the geographical distribution and abundance of wild boar across Europe.